We offer comprehensive horseback rides and trips throughout northwest Montana. 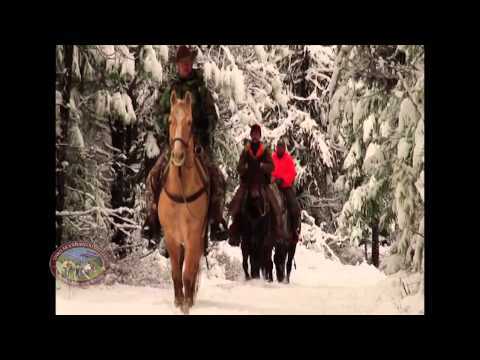 Swan Mountain Outfitters is a premier full service horseback based Montana Outfitter. We offer guided hunting trips, guided fishing trips floating down Swan River or into the Bob Marshall Wilderness, summer pack trips from three to 6 days into the Bob Marshall Wilderness and trail rides in Glacier National Park and the Swan Valley. Our hunting areas support a number of elk herds and ample populations of trophy whitetail deer, trophy mule deer and color-phased black bears. We offer guided Montana elk hunting both in the Bob Marshall Wilderness as well as the Swan Valley. Our archery elk hunts are customized and very different then most guided archery elk hunts in Montana. We offer trophy mule deer hunts, trophy whitetail hunts and combination guided hunts for elk, whitetail, mule deer and bear. You can horseback hunt in the Bob Marshall, Swan Valley, or we can hunt big Montana Whitetails out of our lodge using traditional whitetail techniques. All bear hunting in Montana is spot and stalk, and we offer horseback spring bear hunting for color phased bears. Mountain lion hunting in Montana is very special and we offer guided mountain lion hunts in Northwest Montana is some of the best lion hunting districts in the state. We have under Flathead National Forest and Swan River State Forest more mountain lion hunting permits than any other northwest Montana outfitter. We also offer guided moose hunts, and guided goat hunts to those hunters fortunate enough to draw special permits in the Bob Marshall Wilderness or Swan Valley of Montana. We offer a variety of guided hunting trips for archery and rifle hunters alike, including traditional deer and elk horseback hunts in the back country and in the front range of the Swan Mountains in outfitter camps and whitetail tree stand hunts out of our Montana guest ranch.